WooCommerce comes with various fields for storing product data. There’s the product name, long and short description, price, images, stock, weight, dimensions etc. But what happens if you want to store and display extra product data, such as WooCommerce custom taxonomies? I’m going to tell you how to create WooCommerce custom taxonomies for products. We’ll look at the difference between WooCommerce custom fields and taxonomies and which to use for different types of product data. I’ll also show you how to add custom taxonomies to store extra information about WooCommerce products. Finally, I’ll teach you an easy way to display products with the WooCommerce custom taxonomies in a searchable, sortable table. You can show the extra fields on a normal WordPress page, on your shop or product category pages, or on the single product detail page. You can even let customers filter by custom taxonomy, making it easier to find your products. And best of all, you can do all this without writing a single line of code! Display products with custom fields & taxonomies using the WooCommerce Product Table plugin. What’s the difference between WooCommerce custom fields and taxonomies? The phrases ‘custom fields‘ and ‘custom taxonomies‘ are often mentioned in relation to WooCommerce product data. But lots of people don’t know exactly what they are, and what is the difference. WooCommerce custom fields are used to store arbitrary, one-off information about a product. A custom taxonomy is for grouping things together. Custom fields appear in the main column of the Add/Edit Product screen. This is where you add other unique product data such as title, description, price etc. In contrast, custom taxonomies appear in the right hand column under the product categories and tags. Like categories and tags, each WooCommerce taxonomy term should be selected for multiple products. When should I use custom fields & when should I use a WooCommerce taxonomy? Once you understand the difference between a WooCommerce custom field and taxonomy, it becomes more obvious when to use each one. As a rule of thumb, you can decide between custom fields and taxonomies by asking yourself: “Is the data I am adding unique to each product, or does it apply to multiple products?” If the data is unique for each WooCommerce product then you need a custom field. If you want to select the same value for several products and use it to group them together (e.g. via a product filter) then you need a WooCommerce taxonomy. WooCommerce clothes store displaying the color of each product. If you’re selling clothes in WooCommerce, you’ll probably want customers to be able to find products by color. You’ll have multiple products of each color. By creating a WooCommerce custom taxonomy called ‘Color’, customers can filter the list of products to find the color they like. This wouldn’t be possible with a custom field. WooCommerce second hand site storing ‘condition’ information about their used products. If you’re selling used goods like eBay, you’ll need a field to store details of any damage etc. The description of each item’s condition will be unique to that product, so you should create a WooCommerce custom field. WooCommerce product directory with a large product database. WooCommerce directory-style websites with large numbers of products often list extra product data within the directory listings view. For example, a book directory might include data for author, publisher and year. And if you’re feeling really clever, you can use both together! To use the 2nd example above, a store selling used goods might want a WooCommerce taxonomy called ‘Condition’ AND a custom field called ‘Condition Description’. The ‘Condition’ taxonomy would include the terms “New”, “As New” and “Used”, which apply to multiple products. 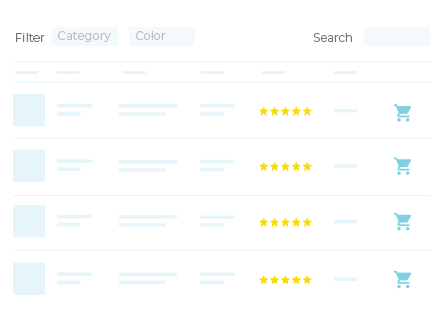 You could create product filters so that customers can narrow down their search based on the overall condition. The ‘Condition Description’ custom field would provide unique information about the exact condition of the product and any damage. Read our tutorial about how to create and show WooCommerce custom fields. The best plugin to create a custom taxonomy for WooCommerce products is Custom Post Type UI. 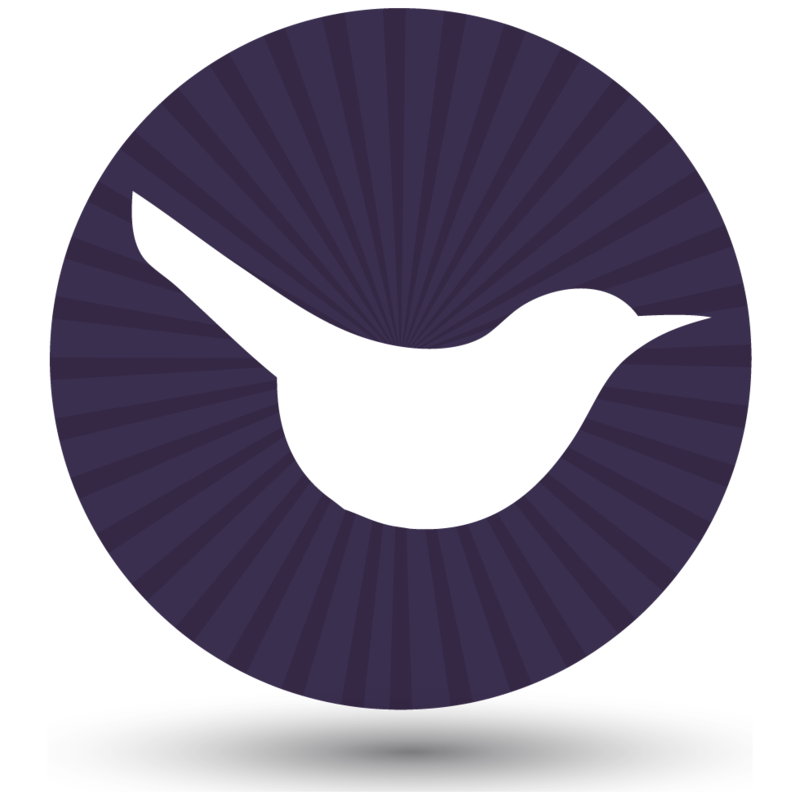 With over 400,000 active users, it’s a hugely popular plugin and is 100% free too! As well as creating custom post types (which you don’t need to do), Custom Post Type UI lets you add taxonomies to an existing custom post type. This is what you need, as WooCommerce products are a custom post type in WordPress. 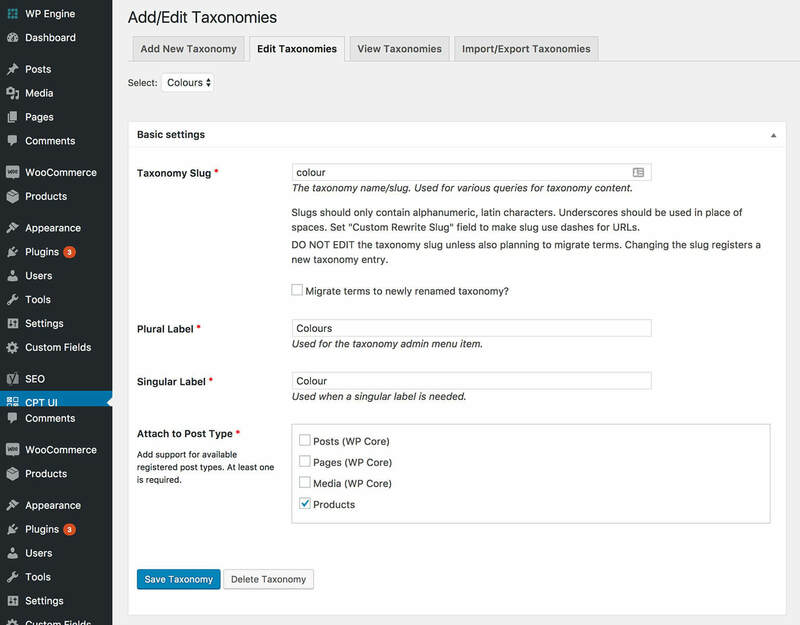 You can also create WooCommerce custom taxonomies with the free Toolset Types plugin. I’ve used Custom Post Type UI in this tutorial, but they’re both good options. Whichever plugin you use to create your product taxonomies, you can display them in the front end using WooCommerce Product Table. Go to Plugins > Add New in the WordPress admin and search for ‘Custom Post Type UI’. Add the Taxonomy Slug (ideally 1 word, lowercase). Add a plural and singular name (label) for your WooCommerce custom taxonomy. This will only appear in the WordPress admin. Attach it to the Products post type. Now go to the Edit Product page and you’ll see the custom taxonomy on the right hand side, under the categories and tags. Add 1 or more taxonomy terms for each product, just like with standard product tags. Normally, the only way to display custom taxonomies for WooCommerce products is to edit the template files for your and product archive pages. This involves a bit of coding knowledge. The good news is that there’s a handy plugin to list products in a table along with extra data such as WooCommerce custom taxonomies. 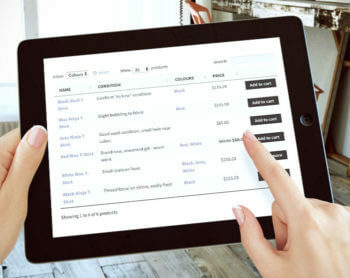 It’s an ideal way to display products with extra information as everything is presented in a structured tabular format. You can add product tables to any WordPress page, to your main WooCommerce shop or product category pages, or even to the single product page. The plugin for displaying custom taxonomies is called WooCommerce Product Table. It supports all the usual WooCommerce product data, plus custom fields and custom taxonomies. Each item of product data is listed as a separate column in the table. Customers can search or sort the table by any product custom taxonomy term. They can also filter by taxonomy via handy dropdown lists above the table. You can even create WooCommerce tables that only contain products with a specific taxonomy term. This is much easier than modifying your WooCommerce template files. And even better, you get all the other benefits from using product table layouts such as improved conversion rates. It’s easy to set up WooCommerce Product Table with all the extra product data. Get WooCommerce Product Table. Download the plugin using the link on the order confirmation page and email. In the WordPress admin, go to Plugins > Add New. Upload the plugin files and install and activate the plugin. Go to the plugin settings page: WooCommerce > Settings > Products > Product Table. Enter your license key and click Save. You can also choose some default settings which will be used for all your product tables. This saves having to create such complex shortcodes later on, as these settings will be used automatically whenever you create a product table. Now, the product table plugin is set up. The next step is to add product tables to your website. Use one of the following methods, depending on where you want to display WooCommerce taxonomies. Go to edit any page in WordPress. This is where you’ll add a table listing some or all of your products with the taxonomies. This will display all your products in a table with standard data. Next, you need to expand the WooCommerce Product Table shortcode to include your custom taxonomies and any other extra data. Each piece of product data will appear in its own column within the table. There are full instructions for all the available columns in the plugin knowledge base. To get you started, here’s an example of a product table with columns for name, a custom field called ‘Condition’, a custom taxonomy called ‘Color’, price and add to cart button. You need to know the custom field name and the taxonomy slug. 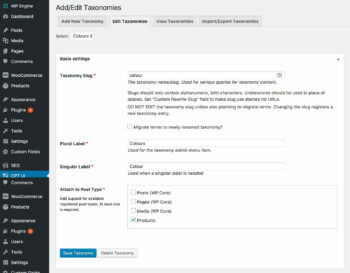 You chose these when you created your custom fields and taxonomies earlier in this tutorial. Most people add WooCommerce Product Table to normal WordPress pages. They include these pages in their website navigation structure instead of linking to the built-in WooCommerce category archives. If you prefer, you can add product tables with custom taxonomies directly to the main WooCommerce shop page or category pages. This is a bit trickier, as you need to add the product table shortcode to the template file in your theme. To make it easier, the plugin knowledge base provides instructions on how to do this. Follow the instructions for adding product tables to the shop or category archive template. Go to edit the product where you want to display custom fields and taxonomies. Add a product table shortcode to the Short Description field. You can use this shortcode as a starting point. This lists the data for the current product. There are columns for a custom field called ‘size’, a custom taxonomy called ‘fabric’, and a stock column. I have hidden elements such as the search box and product name, which aren’t needed on the single product page. include=”19″ – Replace the number 19 with the ID of the product that you want to show the data for. You can find this by going to the ‘Edit Product’ screen in WooCommerce. Look at the URL at the top of your browser window. For example, my example product has the URL /wp-admin/post.php?post=19&action=edit. This tells me that the ID is 19. Do the same and find the ID for your product. You can also make any other changes to the product table, for example by adding or removing columns. See the full list of options in the knowledge base. Now save the product and view it. You will see a simple WooCommerce table in the short description field, containing the custom taxonomy and other product data. You can also list WooCommerce custom taxonomies as a filter dropdown above the product table. You can add a separate filter for each custom taxonomy (plus other data such as attributes, variations, categories and tags – instructions here). By default, your WooCommerce product tables will list all the products in a table. This is perfect if you plan to have a single table listing your entire WooCommerce inventory. You can also create product tables listing products from a specific category, tag, custom field or WooCommerce custom taxonomy term. You can list WooCommerce products with multiple custom taxonomy terms. See the documentation for full details. The WooCommerce Product Table knowledge base contains full details of over 50 options for configuring your product lists. It’s a sophisticated plugin and this tutorial has barely touched the surface of what’s possible. You can design product tables that will increase your sales with our top 10 tips for WooCommerce conversion rate optimisation. Have a read through the knowledge base and plan the perfect product table to display your WooCommerce custom taxonomies. Hi, would like to know how to add woocommerce product table on search result pages? have checked the knowledgebase already. Hi Abby, WooCommerce Product Table doesn't integrate with the main WordPress search or the WooCommerce Product Search. You couldn't add it to the main WordPress search as those contain other types of content and not just products. You could probably modify the product search results template to include a product table. This wouldn't come under our standard support so please let me know if you'd like a quote for this from our customizations service. Great tutorial! This is really helpful to used my business site development. It is very simple. I was trying to use the ACF function to add fields for "Name of Bride & Groom" & "Date of Wedding" on a specific category of products only in my Woo site, but this seems to be limited to adding those globally to all products? Have I understood that right? Is there a better way for me to add these fields to one category of products only. Hi Mark, by default adding a custom field to the 'Products' post type will add it to all products. However, you can leave the custom field box blank for the products in your other categories. Depending on how you're displaying the custom fields in the front end of your website, you might need to do some custom coding to only show the custom fields on the front end product pages for those categories. this article was useful for me. If user buy products in multiply of 6 then 1 kr for shopping beg will add and we also need to add 25% tax on it. Can you help please..
Hi Joy, you should be able to do this through the WooCommerce tax settings. There are plugins such as Min/Max Quantities for WooCommerce if you want to force customers to buy in multiples of 6. Hi Jeff, when you create a custom field using any plugin (e.g. Toolset Types or Advanced Custom Fields), it is added to the back end for each product but not he front end. You would need to do some custom coding to add this to the admin orders, I'm not aware of any off-the-shelf plugins that can do this. If you don't know how to do this yourself, I recommend posting a job on Codeable. Their pre-approved WordPress experts are fantastic for small customisations like this. Hi Abdul, you can get your developer to create custom fields and taxonomies programmatically if you don't want to use a plugin. Most developers use Advanced Custom Fields to create their custom fields, but often create taxonomies without a plugin. Here's a Stack Overflow link to creating custom taxonomies - stackoverflow.com/questions/22791121/how-to-add-new-custom-field-taxonomy-in-woocomerce. Hi Stuart, our plugin just displays custom taxonomies that are already on your site. I had a quick look and couldn't see any plugins for exporting WooCommerce product taxonomies, but this article has some advice on how to do it yourself. I needed exactly this: Extra Product Data & Filters!!! and you helped me do it finally!! Thank you!! I have a site that has more than 1000 products and I have about 10 custom fields and other 10 taxonomies, I am trying to import the products through Products/import and I am able to do it through a cvs file but I don't see the mapping for the created custom fields and taxonomies. Is there a way to import all the custom fields and taxonomies? or after I import the products I have to enter the fields and taxonomies by hand? Hi Guillermo, glad it was helpful. The built-in importer doesn't support custom fields and taxonomies. You can do this using the official Product CSV Import Suite plugin, which has more features. I have done what you suggested and worked perfectly.